The chain of islands that dangles from Florida’s southern tip is experiencing more development and more tourists than ever. Novelist Lisa Unger, who’s been going to the Keys for years, sees a sunny side to the changes that some locals fear. The first word my husband ever said to me was yum. We were on the dance floor of Sloppy Joe’s, the wild watering hole (and Ernest Hemingway haunt) on Key West’s Duval Street. Jeff delivered the verdict with a devilish smile just after stealing a kiss. The blaring music hadn’t allowed for conversation before the smooch, and I was too surprised to utter a response. Still, we left together soon afterward, wandering past the live music and revelers tumbling from other bars onto the sidewalks, escaping the carousal for the quiet side streets of Old Town. They were lined with foliage and “eyebrow” houses with pitched roofs long enough to shade the second-story windows as well as protect the porches. The scent of tropical flowers filled the humid air. Eventually, we wound up on a dock where, against a background of lapping water and clanging halyards, we talked until sunrise. 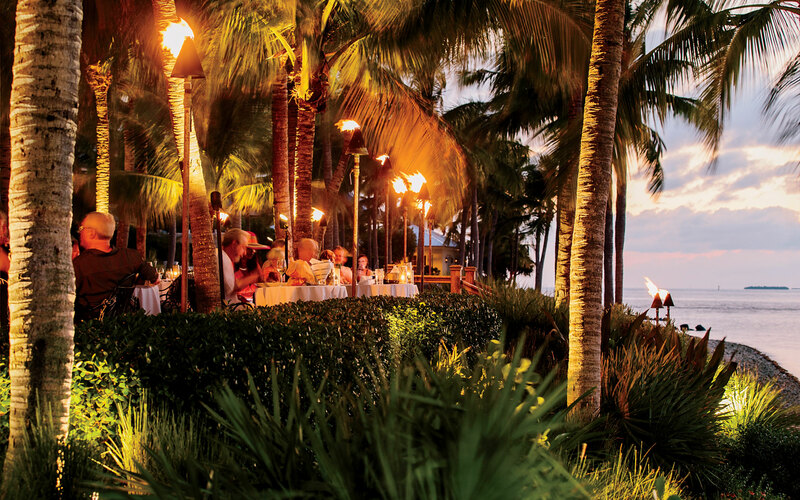 That night—my first in the islands—was classic Florida Keys: carefree, steamy, organic, a little rough and a little refined. Something about the swaying palms and the tropical air, maybe even the tug of the Atlantic tide on one side and the Gulf ’s on the other, had a way of quieting your usual concerns about what might happen next. A lot has changed in the 16-odd years that have passed since then—some say too much. Locals fret that development has run amok, spawning too many condos and restaurants and damaging delicate ecosystems. Though the 120-mile-long string of islands has a population of just under 75,000, an estimated 4.5 million people visited in 2014—a number that increases nearly every year. Then again, we’ve changed, too. A year after Jeff and I met at Sloppy Joe’s, we wed in Key West, silhouetted against the sunset. As a young couple without kids, we returned for romantic getaways and outdoor adventure (and, yes, to continue partying). After our daughter arrived, we pushed her stroller around Sunset Celebration, Key West’s nightly arts festival. We’ve seen the islands evolve, and that hasn’t ruined them for us—quite the contrary. Made up of roughly 1,700 islands—some not much more than a sandbar—the Keys but- ton up the seam between the Atlantic Ocean and the Gulf of Mexico. 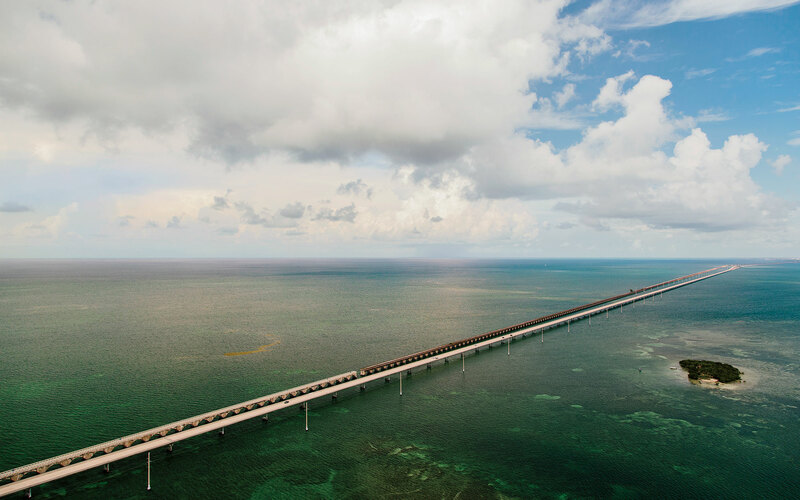 The mangrove-tangled Upper Keys extend from the top of the chain to Islamorada. A popular weekend destination for Floridians, this stretch has an abundance of dive shops, chain hotels, and condo developments. In the Middle Keys, the islands get quieter and farther apart, though Marathon is bustling enough to have big-box stores and an airport. 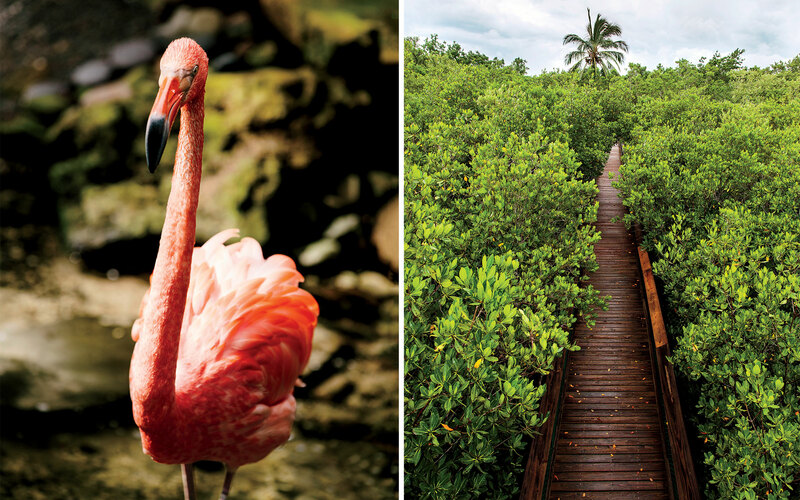 The Lower Keys, which include quirky Key West and the Dry Tortugas, are wilder and greener. A series of 42 causeways runs through the archipelago, carrying U.S. Route 1 to its southernmost point. On our most recent trip, we took a three-day meander down the length of the islands with our nine-year-old daughter, Ocean, making several stops along the way. 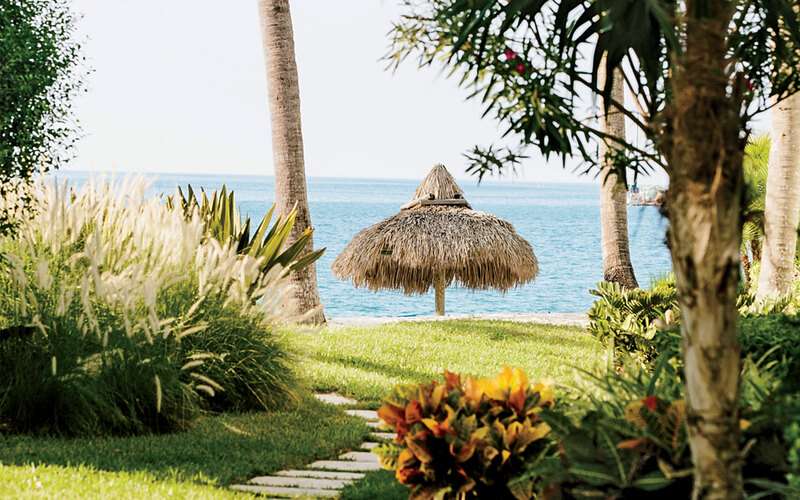 Back when we first started visiting, there was little to please a luxury-loving vacationer in the Upper Keys. It didn’t matter then—like so many others, we came to kayak the green-blue waters, hook marlin and tarpon, scour reefs and wrecks for nurse sharks and moray eels. After a long day on or under the water, a hammock and a cold beer passed for five-star. But in recent years, fancier properties have cropped up— not the worst thing in the world for someone (like me) who has grown to appreciate a high thread count as much as a sunrise paddle. We drove past the strip malls on 33-mile- long Key Largo, heading for Islamorada— which, confusingly, is not an island but a town that covers five keys: Tea Table, Upper and Lower Matecumba, Windley, and Plantation. It’s known for its excellent fishing and seafood shacks that dish up ocean-fresh fare. The first time Jeff came to the Keys, 30 years ago with his parents, they stayed at Islamorada’s Ocean 80. Built in 1972 as a Holiday Inn, by then it was a modest time-share property nestled beside Bud n’ Mary’s Marina and home to Pineapple, a bar that was known for its rowdy evenings. In the 1990s the place was a Hampton Inn with an Outback Steakhouse. In 2014 the property was overhauled to become Amara Cay Resort, whose interiors aim for modern island ease. The large lobby is dotted with cedar-paneled pillars and wicker chairs swinging from the ceiling. Out back are a tidy swimming pool, a rum bar, and a “beach” atop a seawall. Above the bar there’s a painting of a “square grouper”—the Coast Guard’s term for a bale of marijuana tossed into the sea from a boat or an airplane, and a wink to the drug-running that was prevalent here in the 1980s. The first thing we did was settle in for refreshments. I had the Blood Lime, a vodka concoction named in homage to the Netflix series Bloodline. The moody family drama, which was then filming its second season in Islamorada, highlights the beauty of places like white-sand Anne’s Beach, the mangrove swamps, and the serene fishing flats in Long Key State Park. 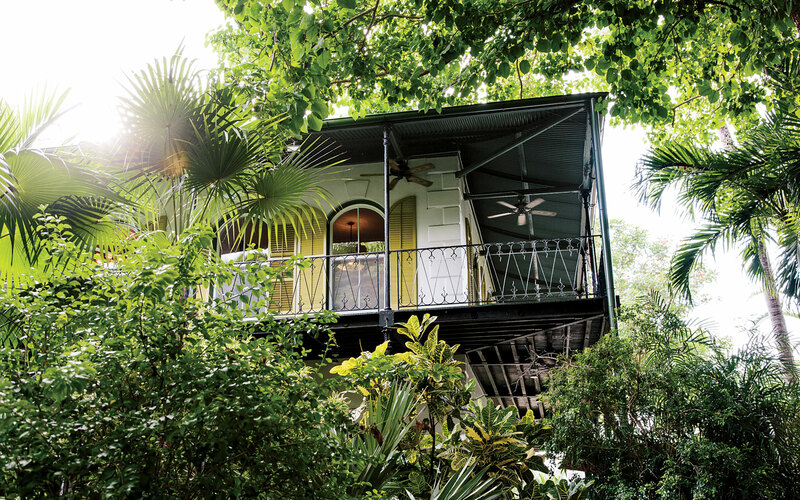 Though the cast and crew have been booking up local homes and hotels—and there are Kyle Chandler and Sissy Spacek sightings—the Hollywood invasion hasn’t disturbed the vibe. “They have kept their presence low-key,” Kara Lundgren, Amara Cay’s general manager, said. The three of us headed out for a swim, first in the Atlantic and then in the pool. With the setting sun painting tiger stripes in the sky, Jeff and I sipped some more cocktails on lounge chairs while Ocean tried to scale a palm tree. Amara Cay was upscale, yet understated and relaxing, a long way from the cracked tile floors and rickety wicker furniture we once expected of the Keys. When Jeff was a child, he and his father would go fishing late at night in Islamorada, toting bait buckets and fishing poles to the remnants of old bridges, left behind as the Overseas Highway was rerouted or expanded. After a dinner of fritto misto, conch francese, and zeppole with Nutella dipping sauce at Amara Cay’s restaurant, Oltremare, we tried to re-create the memory for Ocean. Jeff picked up live bait at Bud n’ Mary’s, just as his dad had. But modern Islamorada let us down—in the heavy traffic, Ocean got carsick; the night was too dark to find the spots Jeff remembered. Disappointed, we dumped our bait and put our girl to bed. The next morning, we awoke to a pastel sunrise and prepared for a morning on the water. If Ocean had been younger, we might have visited Theater of the Sea, an Islamorada institution where visitors can swim with Atlantic bottlenose dolphins, California sea lions, and stingrays. Or we might have gone to see the raptors and sea birds at the Florida Keys Wild Bird Rehabilitation Center. But since she’s old enough to snorkel, we headed to the Florida Reef, the only living coral barrier reef in the continental United States. We met our captain, Chris Gruno, at Seamonkeys, the tiny dive shop on Amara Cay Resort’s docks. He recommended wet suits— the water was warm, but a number of moon jellyfish had been spotted. Their sting, while not dangerous, is unpleasant. Wanting to get into the water as fast as possible, we all opted out of the wet suits and decided to go for it. With the water glassy and the sun bright, conditions couldn’t have been better. Chris zipped us out to Cheeca Rocks, the best nearby area for snorkeling, because the reef comes close to the surface. He reminded us of the rules—no touching, watch where you kick your fins—and said we might expect to see barracudas, rays, turtles, parrot fish, maybe even some nurse sharks. Though the area was dotted with boats, once I was in the water, holding my daughter’s hand, I felt like we were alone. Large, purple moon jellyfish floated in the water—but slowly enough that we could warily evade them. Watching her dive down among the brain coral, attempting to feed fish a bunch of seaweed from her hand, I thought: This is everything I love about the Keys—breathing, being, and watching. Starving after the snorkel trip, we sought out the three-year-old M.E.A.T. 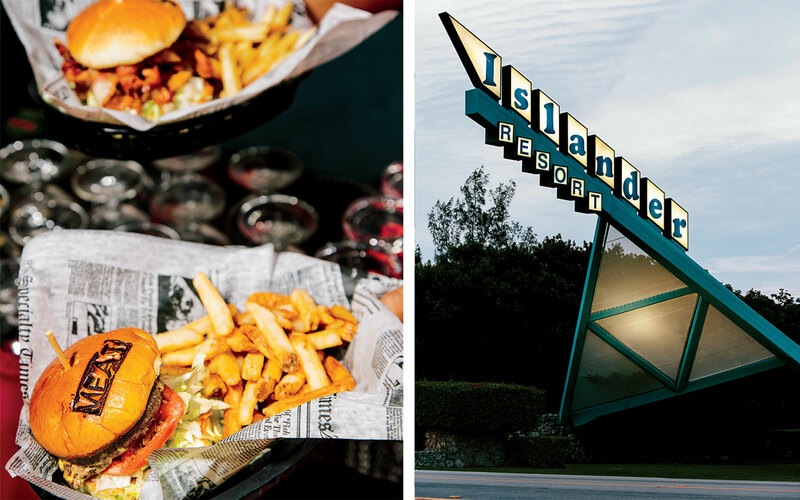 Eatery & Taproom in Islamorada rather than relying on an old favorite like the Cracked Conch Café in Marathon, which serves the best conch fingers in the islands. M.E.A.T. feels like an import, with a giant elk head on one wall, organic wines, a dozen beers on tap, and “adult” milk shakes such as Guinness & Nutella. “There wasn’t even craft beer in the Keys when I first arrived,” co-owner Thomas Smith told me later. “Coming from Colorado, it was a bit of a shock.” But change isn’t always bad—a good burger used to be hard to find in the Keys, and Jeff’s “inside-out juicy Lucy,” a patty stuffed with pimento cheese and bacon and topped with American cheese, is a welcome alternative to classic island cuisine. We continued puttering our way south. In Marathon, we stopped at the Florida Keys Aquarium Encounters, opened in 2014. It’s a slick operation, and felt contrived at first—in a region that boasts some of the world’s best diving, visitors can scuba or snorkel in a 200,000-gallon tank containing an artificial reef. My friend Tara Popick, the one I was visiting on that first trip to Key West, joined us with her nine-year-old daughter, Zoé. The girls ran up and down the wooden walk- ways, visiting the touch tank, a turtle environment, some penned tortoises. They tossed food pellets to tarpons. I began to see the appeal of the place. On the real reef, we had to keep reminding Ocean not to touch anything. We’d been surrounded by stinging jellyfish. Here, she could hold a starfish, pick up a sea cucumber or urchin. At the Stingray Encounter pool, we hand-fed pieces of fish to southern, cownose, and spotted eagle rays the size of bicycle tires. The girls shrieked with delight as rays splashed and tugged food from our fingers. I might have done a little shrieking, too. It was early evening when we arrived in Key West. Duval Street was packed with tourists, shoppers, and revelers. Visitors were gathering for Sunset Celebration as well as Brewfest, an annual celebration of all things beer-related. At one point, we would have wanted to be in the heart of the action. This time, we had dinner, then took a 10-minute ferry ride to Sunset Key. 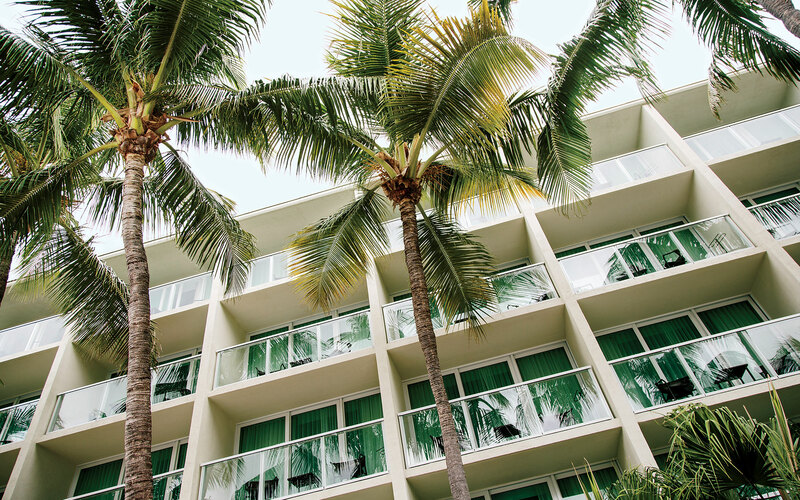 Over the years we’ve stayed at a lot of lovely places in Key West, from big hotels like Ocean Key Resort & Spa to smaller, more intimate inns like the Marquesa. Sunset Key may have been the loveliest. From the boat we stepped onto a private island of winding pathways, glimmering tiki torches, and rows of white cottages. Officially called Tank Island, 27-acre Sunset Key was built by the U.S. Navy, which wanted a fuel-tank depot during the Cold War. In 1994, a local developer bought and renamed the island. Sunset Key Cottages occupies about seven acres, and became part of Starwood’s Luxury Collection in 2014. Our Sunday started with a bit of pampering: room-service breakfast at the sun-dappled table in our eat-in kitchen. A little later, at the spa, a masseuse worked out whatever tension I was still carrying from the real world. I was floaty as we headed back into Key West for the day. We strolled through the glass-enclosed environment at the Key West Butterfly & Nature Conservatory, surrounded by a confetti of live butterflies and tropical birds. Soothing music played; pink flamingos groomed themselves in a trickling stream. At the Ernest Hemingway Home & Museum, we wandered through the 1851 Spanish colonial, built with native limestone taken from the grounds and chock-full of photos, paintings, and books. Ocean and Zoé chased the six-toed cats that are allegedly descendants of those the writer loved. The weather was hot that weekend, the streets and sights packed. Everything from food to sunscreen was overpriced. I hear the complaints about the Keys and how they’re not what they used to be. It’s possible I don’t feel the islands are wrecked because I need them not to be— because this is where our life together began. But maybe it’s because the world’s great travel destinations have the ability to absorb change rather than be absorbed by it. They become richer and more complex. At every stage of our lives these islands have offered something new to inspire, nourish, or entertain us. And yet their mysterious, languid energy somehow remains. The night Jeff and I met at Sloppy Joe’s, the band was playing and the dance floor was pulsing. When we returned near the end of this trip, there was still a crowd and still live music, but lunch tables packed the dance floor instead of partiers. Ocean ordered a virgin strawberry daiquiri. We took selfies. It was very different from that first night, but I also felt like it couldn’t have been better. Amara Cay Resort: An oceanfront property in Islamorada (right) offering a man-made beach with hammocks and thatch huts that are perfect for a relaxing read. amaracayresort.com; Doubles from $189. Sunset Key Cottages: Located on a 27-acre island, this resort can be reached via ferry from Key West. The bright, tin-roofed cottages have two to four bedrooms. sunsetkeycottages.com; Cottages from $695. M.E.A.T. Eatery & Taproom: Burgers are the focus at this Islamorada hot spot; the bar serves alcoholic milk shakes and has a dozen beers on tap. meateatery.com; Entrées $10–$17. Oltremare Ristorante: The restaurant at Amara Cay Resort serves Italian food with a Floridian flair. oltremareristorante.com; Entrées $19–$45. Sloppy Joe’s: This Key West institution and onetime Hemingway hangout has live music and dancing every night. sloppyjoes.com; Entrées $10–$12. Aquarium Encounters: Hands-on exhibits like shark feedings and a 50-species touch tank are the big draw at this Marathon attraction. floridakeysaquariumencounters.com. Ernest Hemingway Home & Museum: The Spanish-colonial estate on Key West is filled with books, photos, and nearly 50 six-toed cats. hemingwayhome.com. Key West Butterfly & Nature Conservatory: View dozens of varieties of butterflies and more than 20 types of exotic birds in this glass-enclosed habitat. keywestbutterfly.com.